A Yorkshire hotelier has fulfilled a lifetime ambition by owning his own country pub. 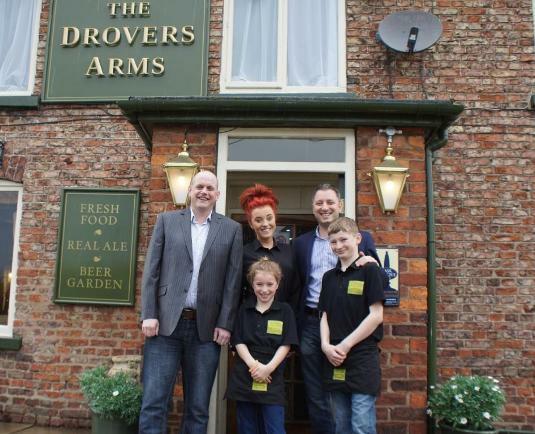 Graham Usher, who has been in the hospitality industry since leaving school, has, with his partner Martin Firth, taken over the Drovers Arms, at Skipwith, near Selby. And the for pair, it is very much a family business as all of Graham’s three children are helping out in the popular inn, which dates back to the mid-19th century. Since taking over the Drovers Arms, Graham and Martin have changed the emphasis from it being “just another pub” to one that serves up traditional, homemade dishes favoured by pub goers and inspired modern British dishes for the true foodies, and for those just popping in for a drink, a selection of award-winning cask-conditioned ales. And, being on the edge of Skipwith Common – one of the last remaining areas of northern lowland heath in England – it welcomes dogs in its bar area. The pair have introduced nightly specials to drawn in clients, plus regular events including wine tasting evenings, themed nights and great value steak deals with meat sourced from God’s own country – Yorkshire. Future plans include creating a first-floor function room which would be able to cater for parties of up to 30, marquee functions or weddings, a cask ale festival and Gourmet dinners. “For as long as I can remember I have wanted to own and run a traditional country pub offering something that little bit different. “My eldest daughter, Elizabeth, has been working in the Drover for the last three years, so I already knew of it when it came on the market. “Martin and I took the view that The Drovers Arms was definitely for us. It ticked all the boxes. “It is in a great location in a beautiful village, a short stroll from a very busy holiday park, has a regular clientele and, more importantly, it has got so much potential. Whilst Graham is busy looking after the pub’s food and beverage operation, Martin, whose day job is at British Gas, is responsible for its online activity.